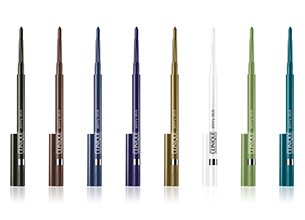 Ultra-fine yet rich colour glides on smoothly to create natural-looking definition as close to the lashline as possible. A precise tip every time–no sharpening required. Ophthalmologist Tested. Allergy Tested. 100% Fragrance Free. I love how thin this liner is, it really allows you to draw the precise line you want, and it never needs sharpening as the tip is always pointy! My only concern is that the liner doesn’t last that long on my eyelids (by lunch time I need to touch it up) and it doesn’t draw on as easily as some of my other pencils do. It comes in a beautiful range of colours and I love how sleek it is!